He was injured and victimized again. Nobody would help him or the other victims. This is how he tried to get justice with uncooperative insurance companies and the unjust judicial system. A person does not have to give up their legal right to use the road because another person chooses to be negligent and break the law. 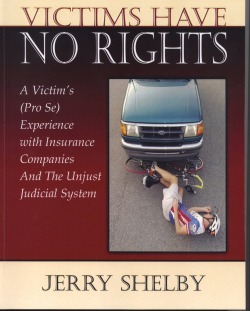 Victims Have No Rights: A Victim’s (Pro Se) Experience With Insurance Companies And The Unjust Judicial System is about the experiences of a victim and other victims I talked to throughout the years dealing with insurance company lawyers, judges, the judicial system, and the people that do not want to be accountable for their bad actions. The book describes the roadblocks and problems encountered that are in place to make the victim fail in getting a fair trial, shows how the victim’s determination to overcome the obstacles to get to trial, and shows what needs to be done to overhaul the unjust system. The book starts with the author describing being victimized several times and gets to the point where he is not going to take it anymore. Someone has to standup to the insurance company, so why not him. Other victims and future victims need a champion to lead the way. The only problem is I didn’t know what to do. The book is how I went from being a victim to being a champion for victim rights and judicial reform. I chronologically described my experience as a victim, my experience serving on juries, my witnessing other trials, my dealing with insurance companies and insurance company lawyers, researching how to file a lawsuit, dealing with the obstacles in the judicial system, the obstructions that are in place to make it difficult for a victim to recover the personal injury and property damage losses from these experiences, and the disappointments with the whole mess of being a victim. There appears to be a double standard for how we are treated when dealing with the courthouse and the judicial system if the victim is a pro se (person that can not afford a lawyer and must represent himself) versus being a lawyer. The judicial system is broken and fails the victim. The judicial system is complicated, inefficient, wasteful, discriminating, petty, adversary, and expensive. The court officials elected to serve the public were no help to me. They discouraged me, hoping I would give up. In the real business world, we use cooperation, common sense, truthfulness, and trust. The judicial was the opposite. When asked for help, I was told if you are not a lawyer, we cannot help you. Is this a double standard? Elected officials will help lawyers, but not victim citizens. Do only the lawyers vote? Negligence is not a crime. It is a civil matter that must be decided by 12 uninterested strangers that do not care about you. My own experience with juries made me decide that I did not want a jury trial. Jurors hear two versions of a story. They must sort out the lies. Jurors cannot make decisions, are inexperienced, biased, unknowledgeable, can’t interpret the law, and can’t ask questions or do investigation, yet they must determine the fate of the victim or negligent party. Some jurors must think that the jury award comes out of their own pocket. After observing several trials, I realized that the playing field would not be level. I would have a tough uphill journey. The insurance company lawyer would find ways to twist judicial procedures, so I couldn’t tell my story or present evidence so the jury could not make this a fair trial. The jury would not hear the whole truth. The jury would be barred from seeing and hearing evidence. To think the judge would be a nonbiased referee was a mistake. The actual experience was not like I read in a book or saw in the movie. The victims and families despised the legal system and the insurance company lawyers. Trials are not about right and wrong. They are about winning. The scale of justice is tilted in favor of the criminal or negligent person. The negligent person only has to convince one juror to get a mistrial. The victim has to convince all 12 jurors to win the case. The law is confusing. Two different states may have the same law, but they might be interpreted differently and get different results. Is this equal justice? Wrong precedents can make other people victims for many years. You, the reader, can decide if the courthouse and the judicial system is an “exclusive club” for only judges and lawyers. Victims “need not apply” for membership. A victim has a more difficult set of rules to get justice. The rules are unwritten and change depending on the victim’s appearance, race, age, and personality. Do laws, or men, or business govern us? If you have power over another, is there equal justice? Do money, power, and resources rule? Is justice biased and blind? You, the reader, can decide if the trials described were fair, if justice was served, and if victims have no rights. Every day we read about victims. Lawyers are not interested in low cost injuries and damages cases. The victims do not know how to file a lawsuit. Insurance companies know this, so they delay and lie to the victim until the statute of limitations expires. The how to books tells the reader what to do, but not how to do it. Therefore, the victim gives up. The negligent person that does not want to be held accountable wins. I was one of those victims several times. Seeing other victims being taken advantage of made me want to standup to the insurance company, but like other victims, I didn’t know how. Victims Have No Rights chronically describes the steps with actual examples of legal documents the victim used in the lawsuit and at the trial, describes how to research the legal documents, where to find the laws, and examples of where the victim is discouraged to continue. The discussion at motion hearings and the trials are included. The reader will feel and know how outrageous and wasteful the judicial system is, and the obstacles a victim has to overcome to get justice, or become a victim again. Victims Have No Rights describes the adversary conflicts in the judicial system. The victim wants to tell his story and get reimbursed for his injuries and damages. The negligent person and his insurance company do not want to pay the victim and tries to block evidence or discredit evidence. Both parties have different versions of the same evidence. One party is lying. I hope the reader will be outraged and demand change. I attended 23 trials to research how to get my case to trial. All 23 cases lost or did not recover all their expenses. The waste, ridiculousness, and outrage of these trials document the ethical consequences for the growing victims club and prove victims have no rights. I hope you will find the book informative, interesting, provocative, disgusting, and alarming; and you will demand the unjust system be changed. Contact your Legislature today. Sample resolutions are in the book at the end of Chapter 10. Jerry Shelby is a retired business manager with a master’s degree in business (MBA), four undergraduate business degrees, and three professional certifications. Mr. Shelby is a community leader and an advocate for families, victims, the poor, the disadvantaged, and the underserved. He has been president or chairman of almost everything he gets involved in. He has received many business, community service, and leadership awards from the community, state, and nation. He has spoken at conferences and the legislature about victim’s rights, judicial reform, healthcare reform, and senior friendly communities. He has written a prior book, several instruction “how to” technical manuals, professional and business papers, detailed procedures for the International Standards Organization (ISO) certification program, and numerous newspaper articles. Share your victim’s story by sending it to victimshavenorights@hotmail.com. The book, Victims Have No Rights: A Victim’s (Pro Se) Experience With Insurance Companies And The Unjust Judicial System, can be purchased from the publisher, Infinity Publishing at 1-877-BUY-BOOK (289- 2665), or their online bookstore at www.buybooksontheweb.com or www.bbotw.com, or at your local bookstore, or on the Internet bookstores AOL, BBN, Amazon, Borders, Waldenbooks, Booksamillion, Walmart, and others. The ISBN# is 0-7414-5212-X. © Copyright 2009. All Rights Reserved. Victims Have No Rights.